Just as the body is one and has many members, and all the members of the body, though many, are one body, so it is with Christ. For in the one Spirit we were all baptized into one body—Jews or Greeks, slaves or free—and we were all made to drink of one Spirit. Indeed, the body does not consist of one member but of many. If the foot would say, “Because I am not a hand, I do not belong to the body,” that would not make it any less a part of the body. And if the ear would say, “Because I am not an eye, I do not belong to the body,” that would not make it any less a part of the body. If the whole body were an eye, where would the hearing be? If the whole body were hearing, where would the sense of smell be? But as it is, God arranged the members in the body, each one of them, as he chose. If all were a single member, where would the body be? As it is, there are many members, yet one body. The eye cannot say to the hand, “I have no need of you,” nor again the head to the feet, “I have no need of you.” On the contrary, the members of the body that seem to be weaker are indispensable, and those members of the body that we think less honorable we clothe with greater honor, and our less respectable members are treated with greater respect; whereas our more respectable members do not need this. But God has so arranged the body, giving the greater honor to the inferior member, that there may be no dissension within the body, but the members may have the same care for one another. If one member suffers, all suffer together with it; if one member is honored, all rejoice together with it. Now you are the body of Christ and individually members of it. And God has appointed in the church first apostles, second prophets, third teachers; then deeds of power, then gifts of healing, forms of assistance, forms of leadership, various kinds of tongues. Are all apostles? Are all prophets? Are all teachers? Do all work miracles? Do all possess gifts of healing? Do all speak in tongues? Do all interpret? But strive for the greater gifts. It has now been two years since we, as a nation, heard an inaugural address, and two more years until we will hear another one – except for the one that Fr. Jim just presented to us. The gospel according to Luke is unique in that it portrays Jesus as giving an inaugural address: one that sums up his entire self-understanding and his entire plan for his life’s work. “The Spirit of the Lord is upon me, because he has anointed me to bring good news to the poor. He has sent me to proclaim release to the captives and recovery of sight to the blind, to let the oppressed go free, to proclaim the year of the Lord’s favor.” Those words, which Jesus read from the third part of the book of Isaiah, describe exactly what Jesus’ entire public ministry will be about: the work to which he will dedicate the rest of his life. As such, they set the agenda for what our entire lives and ministries must be about, too. Jesus began with a reference to his being anointed by the Holy Spirit for what he had been sent to do. But so have we. In the rite of Baptism, the bishop or priest anoints our forehead and declares to us (The Book of Common Prayer, page 308), “You are sealed by the Holy Spirit in Baptism and marked as Christ’s own for ever.” Jesus’ work is now our work as well. It is a work of proclaiming by word and example the Good News that the reign of God has come into the world and of making the coming of that reign a reality by working to transform the world to be more what God intends it to be. It is a work of going out and touching and changing lives. That’s an appealing idea, a nice theory. But it is one that we can place up here in the air somewhere and simply walk away, carefully keeping it at a safe distance. We can try to relegate it either to the distant past or to some indefinite future. We can try to fool ourselves into thinking that Jesus did it all for us long ago, or to deceive ourselves into imagining that it is something that we might actually do someday – someday, just not now. We human beings really don’t seem to change very much from age to age. Jesus’ original audience at that synagogue in Nazareth might have tried to do the same sort of thing. But Jesus quickly put an end to it. Here’s a bible trivia question for you. In the gospel according to Luke, except for that brief quotation from the book of Isaiah, what is the first word that Jesus utters in his entire public ministry? You heard the answer in the gospel reading. It is the word “today”: “Today this scripture has been fulfilled in your hearing.” Not 2000 years ago. Not in some fictitious future. But today. And “today” is the most challenging and frightening and demanding time of all. 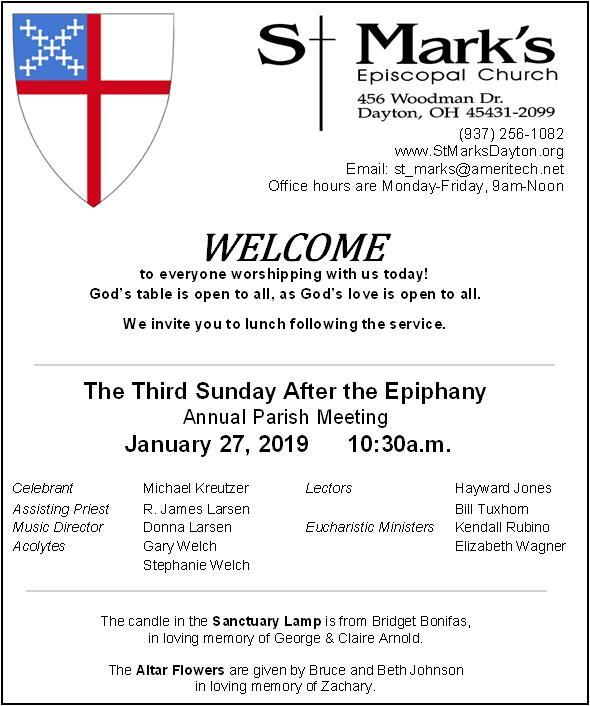 For over 80 years – for almost 30,000 “todays” – the people of St. Mark’s Church have been at work, trying to live out Jesus’ commission, trying to live out our baptismal promises. Inevitably, some of those daily attempts have been a lot more successful than others. And now it is our turn. As we gather for our Annual Parish Meeting, we review what we have done and what we have accomplished in our ministry over the past year. And we look forward to the challenges and opportunities that wait for us over the coming year. But most of all, we rededicate ourselves to living in that most challenging and frightening and demanding time of all: today. We ask God blessings in giving us each “today” our daily bread; so that, in faithfulness to our call and to our anointing with the Holy Spirit, we might live into Jesus’ vision and live out the gospel each and every today.